Russian ballet (French: Ballet russe) is a form of ballet characteristic of or originating from Russia. Until 1689, ballet in Russia was nonexistent. The Tsarist control and isolationism in Russia allowed for little influence from the West. It wasn't until the rise of Peter the Great that Russian society opened up to the West. St. Petersburg was erected to embrace the West and compete against Moscow’s isolationism. Peter the Great created a new Russia which rivaled the society of the West with magnificent courts and palaces. His vision was to challenge the west. Classical ballet entered the realm of Russia not as entertainment, but as a “standard of physical comportment to be emulated and internalized-an idealized way of behaving.” The aim was not to entertain the masses of Russians, but to cultivate a new Russian people. Empress Anna, (1730 – 1740) was devoted to ostentatious amusements (balls, fireworks, tableaux), and in the summer of 1734 ordered the appointment of Jean-Baptiste Landé as dancing-master in the military academy she had founded in 1731 for sons of the nobility. 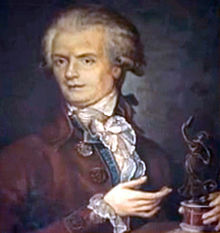 In 1738, he became ballet master and head of the new ballet school, launching the advanced study of ballet in Russia, and winning the patronage of elite families. France provided many leaders such as Charles Didelot in St Petersburg (1801-1831), Jules Perrot (1848-1859) and Arthur Saint-Léon (1859–69). Russia was incapable of simply bringing Russian culture to the West, but created a paranoia of intentions wherever they went. In the beginning, the relationship between Russia and France through the arts was a testimony to their political allegiances. “French critics acknowledged a shared choreographic heritage: French ballet had migrated to Russia in the nineteenth century, only to return, decades later, under the guise of the Ballets Russes. The company, then, moored in a history that intertwined both nations, not only contributed to a cultural programme of exchange. The Ballets Russes were a testament to Franco-Russian cooperation, goodwill and support; they represented ‘un nouveau resserrement de l’alliance’ (a further strengthening of the alliance).” However, the relationship made a negative turn when duplicity amongst the alliance arose. While Russia continued to borrow money from the French banks, “the Russians no longer interested in supporting French culture and colonial politics.” This duplicity gave fuel for the paranoia and lack of trust we see in the relationship concerning the arts. The Parisian press spoke of the Ballets Russes in terms of both “enchantement’, ‘bouleversement’ and ‘fantaisie’. Yet they also invoked metaphors of invasion, describing the company’s Parisian presence in terms of ‘assaut’ (onslaught) and ‘conquete’ (conquest).” The dual-faceted relationship can be seen in this expression of both enrapture and contention. One French journalist, Maurice Lefevre, called on his fellow Parisians to see the reality of the Russian invasion as though it was an infestation, “We need to do some soul-searching and ask whether our guests are not about to become our masters.” To imply that Russia was about to take over France through performing arts seems to be irrational, but evidence would suggest the fears were real among those in Paris. The first ballet company was the Imperial School of Ballet in St. Petersburg in the 1740s. Sergey Diaghilev, (1872-1929), an enormously important figure in the Russian ballet scene, founded the ballet company Ballets Russes in the 1909. Diaghilev intervened in every aspect of ballet - direction, production, lighting, scenery, and performance. He headquartered his ballet company in Paris. A protégé of Diaghilev, George Balanchine, founded the New York City Ballet in 1948. Today, the Kirov Ballet company (now known as the Mariinsky Ballet) and the Bolshoi company are two world-renowned Russian ballet companies that tour the world. ^ a b c d Davinia Caddy, The Ballets Russes and Beyond: Music and Dance in Belle-Epoque Paris (Cambridge: Cambridge University Press, 2012), 34. ^ a b c Caddy (2012), 34. ^ Sergeĭ Leonidovich Grigorʹev, The Diaghilev Ballet, 1909-1929 (Constable, 1953). Andre, Paul; Arkadyev, V. (1999) Great History of Russian Ballet: Its Art & Choreography (1999). Surit͡s, E. I͡A, and E. I︠A︡ Surit︠s︡. (1990) Soviet Choreographers in the 1920s (Duke Univ Press, 1990). The Bolshoi Ballet is an internationally renowned classical ballet company, based at the Bolshoi Theatre in Moscow, Russian Federation. Founded in 1776, the Bolshoi is among the world's oldest ballet companies. It only achieved worldwide acclaim, however, in the early 20th century when Moscow became the capital of Soviet Russia. Along with the Mariinsky Ballet in Saint Petersburg, the Bolshoi is recognised as one of the foremost ballet companies in the world. Agrippina Yakovlevna Vaganova was a Russian ballet teacher who developed the Vaganova method – the technique which derived from the teaching methods of the old Imperial Ballet School under the Premier Maître de Ballet Marius Petipa throughout the mid to late 19th century, though mostly throughout the 1880s and 1890s. It was Vaganova who perfected and cultivated this form of teaching the art of classical ballet into a workable syllabus. Her Fundamentals of the Classical Dance (1934) remains a standard textbook for the instruction of ballet technique. Her technique is one of the most popular techniques today. Svetlana Yuryevna Zakharova is a Russian prima ballerina with the Bolshoi Ballet and an étoile of the La Scala Theatre Ballet. La Bayadère is a ballet, originally staged in four acts and seven tableaux by French choreographer Marius Petipa to the music of Ludwig Minkus. The ballet was staged especially for the benefit performance of the Russian Prima ballerina Ekaterina Vazem, who created the principal role of Nikiya. La Bayadère was first presented by the Imperial Ballet at the Imperial Bolshoi Kamenny Theatre in St. Petersburg, Russia, on 4 February [O.S. 23 January] 1877. From the first performance the ballet was universally hailed by contemporary critics as one of the choreographer Petipa's supreme masterpieces, particularly the scene from the ballet known as The Kingdom of the Shades, which became one of the most celebrated pieces in all of classical ballet. By the turn-of-the 20th century, The Kingdom of the Shades scene was regularly extracted from the full-length work as an independent showpiece, and it has remained so to the present day. 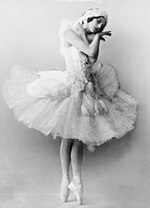 Olga Alexandrovna Spessivtseva (Russian: Ольга Алекса́ндровна Спеси́вцева was a Russian ballerina whose stage career spanned from 1913 to 1939. The Sergeyev Collection is a collection of choreographic notation, music, designs for décor and costumes, theatre programs, photos and other materials that document the repertory of the Imperial Ballet of St. Petersburg, Russia at the turn of the 20th century. The majority of the choreographic notations document with varying degrees of detail the original works and revivals of the renowned choreographer Marius Petipa, who served as Premier Maître de ballet of the St. Petersburg Imperial Theatres, as well as notation and music documenting the ballets of Lev Ivanov, who served as second Maître de ballet. Also included in the collection are choreographic notation documenting dances from various operas by both Petipa and Ivanov, respectively. The Whims of the Butterfly is a ballet in 1 act, with choreography by Marius Petipa, and music by Nikolai Krotkov. Libretto by Marius Petipa, based on the poem The Grasshopper Musician by Yakov Polonsky. Ballet is a formalized form of dance with its origins in the Italian Renaissance courts of 15th and 16th centuries. Ballet spread from Italy to France with the help of Catherine de' Medici, where ballet developed even further under her aristocratic influence. An early example of Catherine's development of ballet is through 'Le Paradis d' Amour', a piece of work presented at her daughter's wedding, Marguerite de Valois to Henry of Navarre. Aristocratic money was responsible for the initial stages of development in 'court ballet', as it was royal money that dictated the ideas, literature and music used in ballets that were created to primarily entertain the aristocrats of the time. The first formal 'court ballet' ever recognized was staged in 1573, 'Ballet des Polonais'. In true form of royal entertainment, 'Ballet des Polonais' was commissioned by Catherine de' Medici to honor the Polish ambassadors who were visiting Paris upon the accession of Henry of Anjou to the throne of Poland. In 1581, Catherine de' Medici commissioned another court ballet, Ballet Comique de la Reine, however it was her compatriot, Balthasar de Beaujoyeulx, who organized the ballet. Catherine de' Medici and Balthasar de Beaujoyeulx were responsible for presenting the first court ballet ever to apply the principles of Baif's Academie, by integrating poetry, dance, music and set design to convey a unified dramatic storyline. Moreover, the early organization and development of 'court ballet' was funded by, influenced by and produced by the aristocrats of the time, fulfilling both their personal entertainment and political propaganda needs.